Sitelok is a powerful PHP / MySQL based membership software script that allows you to password protect pages to create members only areas on your website. Its easy to use and no PHP knowledge is required. Users can be members of one or more usergroups so you can control who has access to each page. Everything that a user sees such as login or registration forms can be integrated into your site to match perfectly without using messy looking templates or ugly browser login boxes. Adding users to your site is easy with our membership software. Depending on your site you can have users join by free registration, by using payment buttons for paid sites, by adding them manually via the Sitelok control panel or even programmatically using the Sitelok API. No matter how they join each user can be a member of one or more usergroups each with their own expiry date so that you have full control over what they can access and for how long. Using a simple code snippet pasted into the top of each page you can control which usergroup(s) have access. For example the following snippet would only allow users of the GOLD usergroup access. You can even setup pages to allow visitor access while making parts of the page visible only to members. Thats a great way to tempt visitors with content so that they are more likely to join to get full access. Using simple snippets you have full control of the page or parts of the page based on usergroup or even specific users. Download links for files stored locally or on Amazon S3 can be fully secured too. You can display the users name, username, email or any of the other 50 custom fields in the page so welcoming members by name is easy. Sitelok has a built in snippet generator so there is no need to write any code. 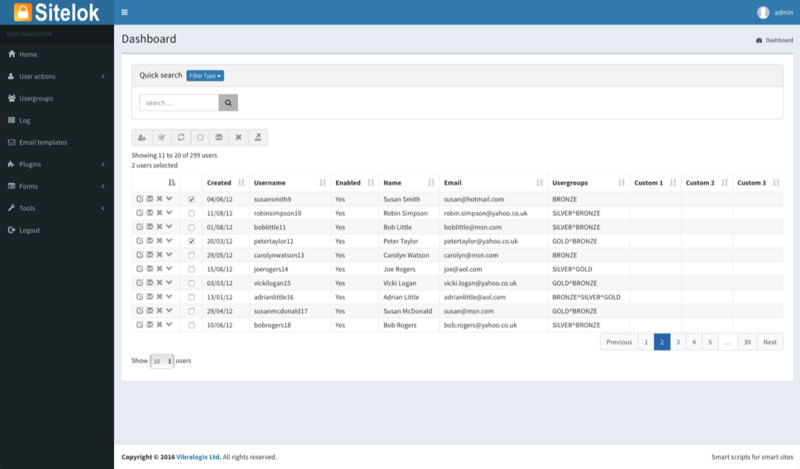 Sitelok has an easy to use control panel where you can manage users, view access logs, create backups, import and export users as well as search for, filter and select users. A powerful email system lets you send personalised template based emails to any number of users based on usergroup or any other criteria. Built in form designers make it easy to create responsive login, registration, update profile and contact forms ready to paste in your pages. A wide range of plugins are available to extend the feature set of Sitelok and to connect to third party systems. These include Facebook login and signup, reCaptcha, Amazon SES, Paypal, Stripe, 2checkout, Quick Messaging, Credits, Vanilla Forums, Mailchimp, Follow on email, Zendesk, Aweber, OTP Token login & others. Many of the plugins are free of charge for licensed users. You can see further details and download the manuals for each one on our plugins page. Checkout our Credits plugin which allows you to use credits for downloads or other content. If you prefer click here to view this video in YouTube (captions available). For security reasons we have disabled the ability to modify any user details or to send emails etc but it should give you the feel for how it works. You may find it helpful to download the manual also. In the demo we have left the passwords in plain text but you can of course store them using extremely secure hashes. To return to this page just click the logout link in the demo control panel main page. I couldn't be happier with Sitelok and its extensive manual. Support doesn't get any better. This may be the best value for the money I've ever spent. It is a pleasure to find such great software, human-friendly service, and a very well written manual --- all in the same place. I have been using sitelok now for a few months. It is absolutely AWESOME, FLAWLESS, and I love it. Want to know more about our membership software? Why not download the manual so that you can see what Sitelok can do for you. We provide extensive documentation in PDF format for our products and not just a quick readme text file. Manuals for Sitelok plugins can be downloaded from the plugins page. Sitelok membership software can be used with most website editors such as Dreamweaver that allow access to the html source of the page. We have also written some supplementary manuals to help users with some popular web design packages as well. Sitelok is a PHP membership script with a huge number of features so we have only listed the most used here. You can download the comprehensive PDF manual for full details. Easy to install on almost any server supporting PHP and Mysql. No PHP knowledge is needed. Can secure .php pages and also .html pages on servers that allow PHP to be used in .html pages (most do). Sitelok can also secure download files stored locally or on Amazon S3. Users can register for free access or you can use payment plugins to charge for membership. Mobile friendly Login, registration and update profile forms can be easily created using the built in form designers ready to be pasted in your pages. It's also possible to use your own form code. Optional captcha, forgot password, remember me and auto login features. Up to 50 custom fields of data can be stored for each user along with the username, email and name. User data can be displayed on pages or in emails. Pages can be secured by usergroup or for specific users if required. Optionally you can allow public visitors to view all or parts of the page if required. Option to allow search engine access to the secured pages. You can defined which usergroup the search engine access the pages as. Powerful & responsive control panel for easy user management. Easily find, filter, import, export or email users. Use the built in template based wysiwyg email editor to send emails to selected users based on usergroup membership or almost any other criteria. Built in backup system allows you to back up the database for safety and to help with migration to a new server. Plugin system allows for many new features and enhancements. See plugins. Integrates seamlessly with Linklok Paypal, Linklok 2CO, Linklok Mals, Linklok Clickbank and Linklok ASecurecart. Developer friendly so advanced users can use Sitelok as the basis for complex applications. The full source code is available and an API allows advanced users to create users and to access and modify member data. Works great whether you have 100 users or 100,000+ users. Sitelok membership software works on most Linux or Windows servers whether shared or dedicated. Just check that the server has PHP 5.3.7 or later (including PHP 7) and MySQL access (most do). We can recommend A2 Hosting for use with our website scripts but most hosting plans are fine. We advise clients to download and read the manual before purchasing. First of all I'd like to thank you for the Sitelok program, it does exactly what I have been looking for. I must also congratulate you on the excellent manual supplied with it, it is probably one of the best I have ever received with any program. Great script....easy to install and very flexible and powerful. Sitelok costs just $39.95 plus VAT where applicable (for use on one domain) and is available for immediate download after purchase. It's a one off fee and not a subscription. The purchase includes one year of free upgrades and support. If in the future you require additional licenses these are available at a discount of 50% (contact us for details). If you would like more information on the Sitelok membership software, please feel free to get in touch through our contact page, where one of our membership software experts will be more than happy to assist you with your query.